Our Kefalonia sightseeing guide gives you a filterable list of the main sight seeing attractions in Kefalonia, although Kefalonia doesn’t have any ancient historical sites like other islands or the mainland it does have a few things to keep you busy. The main sight seeing attractions are probably the Melissani Lake Caves, the Drogarati Caves, Fanari lighthouse or the castle of Saint George. There aren’t too many family friendly sights in Kefalonia, that’s not to say that the places are dangerous for kids it’s just they’ll probably be bored at them. There’s religious sites, caves and man made structures, none of which offer much for youngsters to do whilst there. Obviously with all the fantastic beaches and hotels with great facilities Kefalonia is still a great place for families. As mentioned, Kefalonia doesn’t have a wealth of ancient historical sites, mostly due to the seismic activity that’s happened on the island over the years with one huge earthquake in 1953 destroying a large portion of the islands buildings. There are still a couple with The Tholos Tomb at Tzannata being one and the Acropolis of Sami being another. Check those out below if you are interested in historical sites. 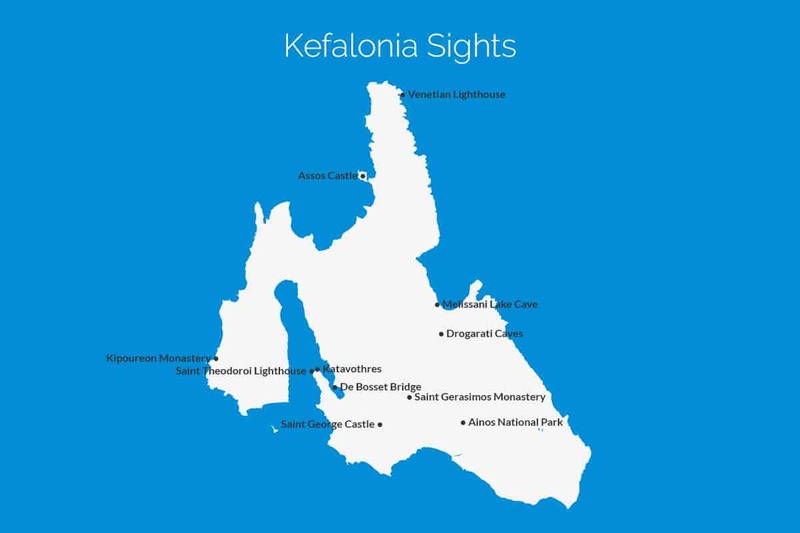 Listed below are the 9 main attractions in Kefalonia, all you have to do is click the ones you are interested in and that’ll take you to a page that gives you a more in depth look at that particular sight with descriptions, map, quick look icons and much more. Ainos national park is based around Mount Ainos, sometimes known as Mount Aenos, and offers spectacular scenic views of Kefalonia island. Ainos is the tallest mountain in Kefalonia and is roughly a mile high. It’s great for hiking and there’s lots of wildlife to see whilst there including herds of goats, wild horses as well as several birds. Assos castle is found in the hills above the tiny fishing village of Assos. It’s just under an hours drive from the capital Argostoli. The remains of the castle consist mainly of just the external walls and an entrance gate but there’s also an old chapel and the remains of other internal buildings too. There’s no entrance fee to get into the castle. The Castle Of Saint George is in a spectacular location and offers amazing views over the island, on a good day you can even see Zakynthos and mainland Greece. The castle is located off the main road that runs from Argostoli down towards Skala, it has no guide and there isn’t much to see other than the ruined walls. The De Bosset Bridge lies in the bay of Argostoli, it’s also sometimes known as Drapano Bridge. It was built in 1813 by Swiss engineer Charles Philippe De Bosset, It’s about 690m long making it the longest stone bridge over the sea in the world. The bridge links the Fanari peninsula, where Argostoli is, to the main body of Kefalonia island. The caves are approximately 60m deep and are full of stalagmites and stalactites formed over millions of years in limestone, the caves are known to have very good acoustics and on occasion have hosted concerts with up to 500 people attending. There is a small cafe for refreshments and you’ll probably need it as there are a lot of steps down, and back up. Katavothres is a geographical phenomenon that occurs on Kefalonia where the sea water rushes through the rocks at the shore and disappears underground only to resurface at the Melissani Lake cave on the other side of the island approximately 15 kilometres away. This event was discovered in 1963 when some purple dye was added to the water. he Melissani lake cave is close to the resort of Sami, the lake, or at least part of it is inside the cave, a section from the top of the cave has collapsed leaving an opening that bathes the inside in light, this is particularly amazing at around mid day as the sun is directly above and the reflection from the lake water covers the cave wall in blue light. The Monastery of Kipoureon, sometimes also known as Kipouria Monastery is an incredibly scenic place that was built right on the edge of the cliff. The monastery is located on the west coast of the Palliki peninsula roughly 15km from Lixouri. The monastery contains many important religious artefacts, including the icon of the Virgin Mary’s Annunciation. Saint Gerasimos Monastery is just off the main road a few miles out of Argostoli. It’s a large religious site dedicated to Saint Gerasimos who the Kefalonians believe protects and heals them. The monastery houses many religious artefacts and also has the body of the saint in a small chapel in the garden. The Saint Theodoroi Lighthouse, also known as Fanari Lighthouse is found on the northern tip of the Argostoli peninsular in Kefalonia. Saint Theodoroi Lighthouse is a circular structure with 20 columns that stands 8m tall. It was built in 1828 by Charles Napier on a man-made peninsular, just off the coastal road between Lassi and Argostoli. We want Which Greek Island to be as accurate and informative as possible, so, if you notice anything wrong with the Kefalonia sightseeing guide or any other page please let us know. We’re also on the lookout for great photos to show people what the places we’re describing are like. If you have photos from any of the attractions in Kefalonia or from any of other island on the site then we’d love to see them, simply click the button below to go to the photo upload page. Thanks.